We are thrilled to announce that Rob|Arch 2016 will take place shortly before Easter 2016 in Sydney Australia, with Dagmar Reinhardt and Rob Saunders of the University of Sydney as conference chairs. They are joined by Marjo Niemelä (University of Sydney), Mari Velonaki and Hank Haeusler (UNSW), Chris Knapp and Jonathan Nelson (Abedian School of Architecture, Bond University), Jane Burry, Roland Snooks, and Nicholas Williams (RMIT), Dave Pigram (UTS), and Tim Schork and Jon McCormack (Monash University) as co-chairs. The adoption of digital fabrication in the creative industries continues to accelerate as the potential for innovation and creative expression using robotics is being harnessed. 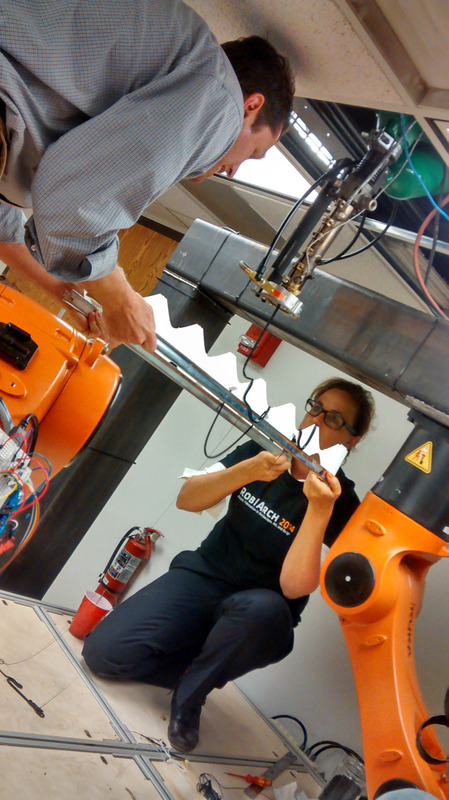 ROB|ARCH2016 will provide hands-on experience with the most recent robotic technologies as well as a platform for dissemination and an opportunity for researchers and industry to exchange expertise, explore methods, compare techniques and forge new connections. The organisers of ROB|ARCH2016 invite authors to submit papers with original research relating to the use of robots in architecture, art, and design. The purpose of this year’s conference is to advance the discourse surrounding robotic fabrication and creative robotics in its theme “Trajectories” – towards the integration of human-robot interactions informed by sensor input and real-time feedback in diverse environmental conditions. For details, visit the CALL FOR PAPERS page. The ROB|ARCH conference series aims to allow practitioners to share expertise, to bring together teams of international researchers, to foster networks, to increase knowledge, and to stimulate innovation. To achieve this aim the ROB|ARCH conferences combine academic presentations with hands-on workshops held in the three days preceding the conference. ROB|ARCH 2012 and 2014 offered workshops from world-class research institutions such as ICD Stuttgart and ETH Zurich, and even Oscar-winning companies such as Bot&Dolly. For 2016 we are again sending out a CALL FOR WORKSHOPS and encourage researcher, industry, and talented individuals to propose a workshop for ROB|ARCH 2016. For details, visit the CALL FOR WORKSHOPS page. 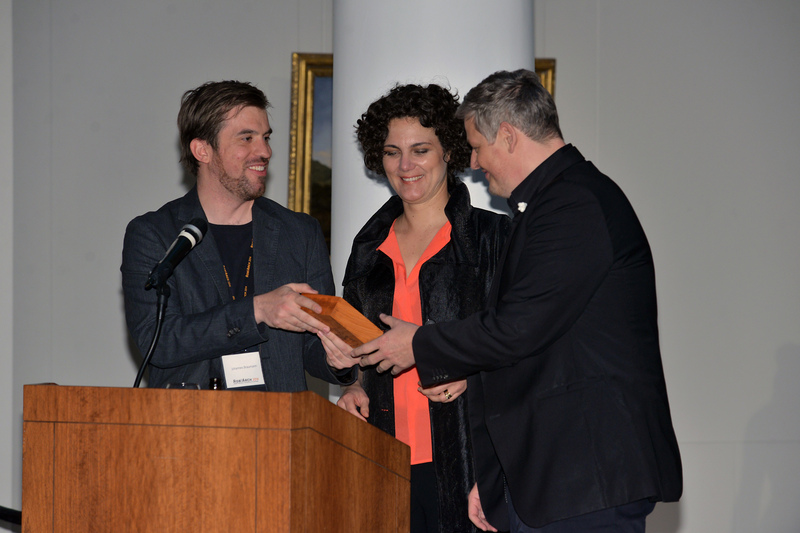 Rob|Arch 2014 was a GREAT success, we want to thank the conference chairs Wes McGee and Monica Ponce de Leon from the University of Michigan’s Taubman College of Architecture and Urban Planning, as well as their entire team, especially Deniz McGee and Aaron Willette for hosting such a perfect conference. We also want to thank our more than 200 (!!!) attendees from all around the world, especially those who actively contributed workshops and papers to the Rob|Arch community. Finally our thanks go out to our industry partners – main conference sponsor KUKA, main workshop sponsors ABB, as well as Stäubli and Schunk. The hard-working workshop-teams were held awake on the 14th and 15th by our media partner Red Bull‘s “Wing Teams” who distributed all flavors of Red Bull, while event partner Absolut really spiced up the exhibition evening-event on the 18th by providing 50 bottles of Absolut and a “Absolut Robots in Architecture” cocktail that was specially created by the award-winning barkeeper Lukas Hochmuth. 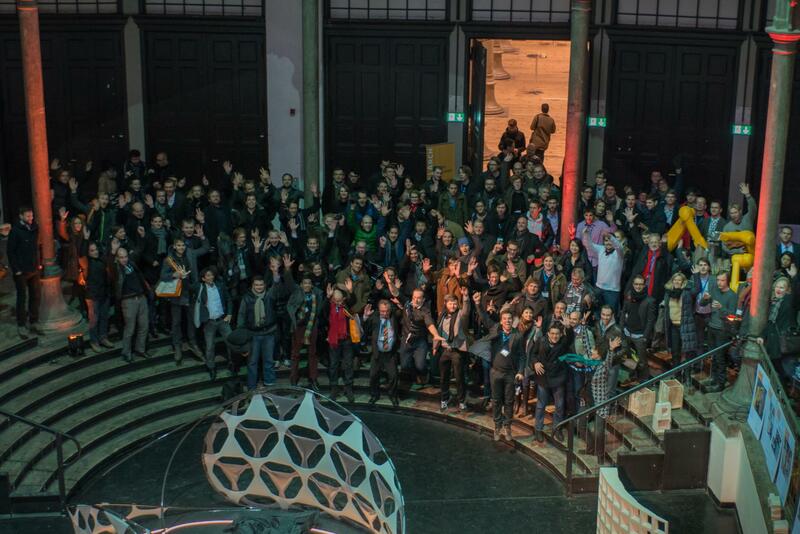 As you can see, Rob|Arch 2014 had both hands-on and theory, industry and academia, makers and enterprises, scientific conference and party. We hope to see many of you again in 2016!!! Tagboard – A social media collection of over 250 posts including Instagram, Facebook, Twitter, etc. 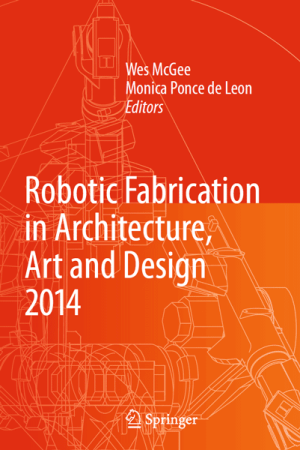 Less than two years ago, in December 2012, the Association for Robots in Architecture hosted the first international conference for robotic fabrication in architecture, art, and design. Initially conceptualized as a medium-sized symposium, it became a full-sized conference with 8 conference workshops distributed throughout Europe, with many European institutions hosting US universities such as Harvard doing a workshop at TU Graz, the Taubman College partnering up with TU Delft, and SciArc’s team coming to TU Vienna’s facilities. As such, the idea was to turn that around for Rob|Arch 2014, with the conference taking part in the US and hosting workshops from abroad. Already at Rob|Arch 2012, Wes McGee of the University of Michigan’s Taubman College of Architecture and Urban Planning expressed interest in hosting the next conference in Ann Arbor. 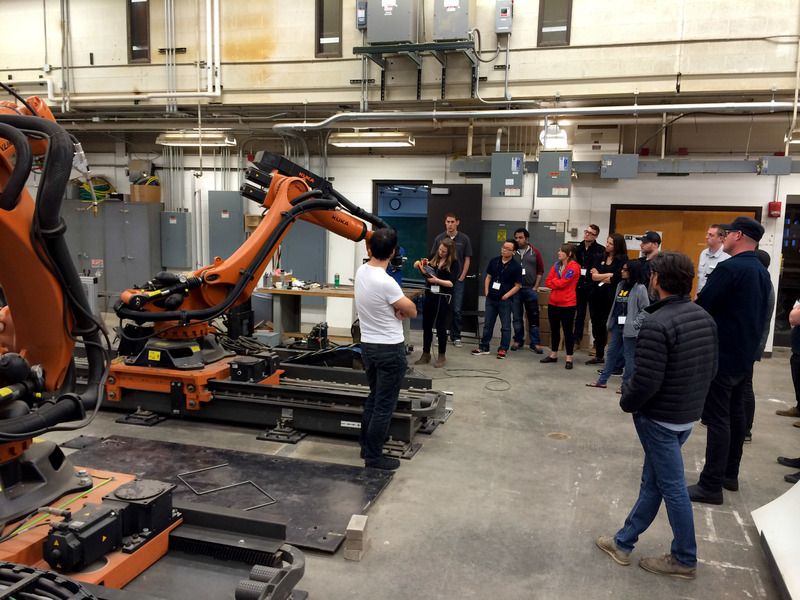 As the world’s largest “architectural” robotic lab, the Taubman College was a logical choice, and we were delighted when Dean Monica Ponce De Leon joined the effort as conference chair alongside Wes, showing the significance of the conference topic, not just for Taubman College but also the architectural community. When the Call for Workshops went out to academic institutions worldwide there was again a great international resonance from the community, with Carnegie Mellon University joining as workshop host. Finally, eight robot workshops were selected for Rob|Arch 2014, with the Taubman College hosting 4 workshops: a joint workshop on steel-bending with the University of Technology Sydney, a carbon-fibre winding workshop by the University of Stuttgart, a workshop involving sensors and Arduinos by IAAC, and finally a special workshop by Bot & Dolly, who showed some of the programming approaches that were used in projects such as the Oscar-awarded movie Gravity. 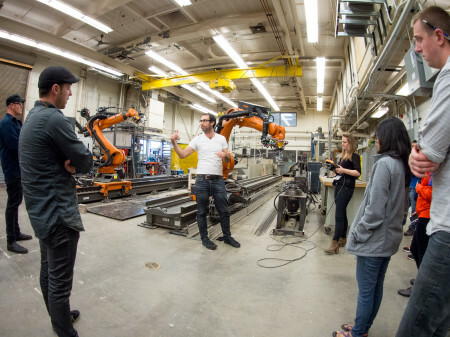 At CMU, three workshops took place: Steambending of wood was explored by CMU, while the University of Innsbruck and Harvard GSD explored phase-change materials. 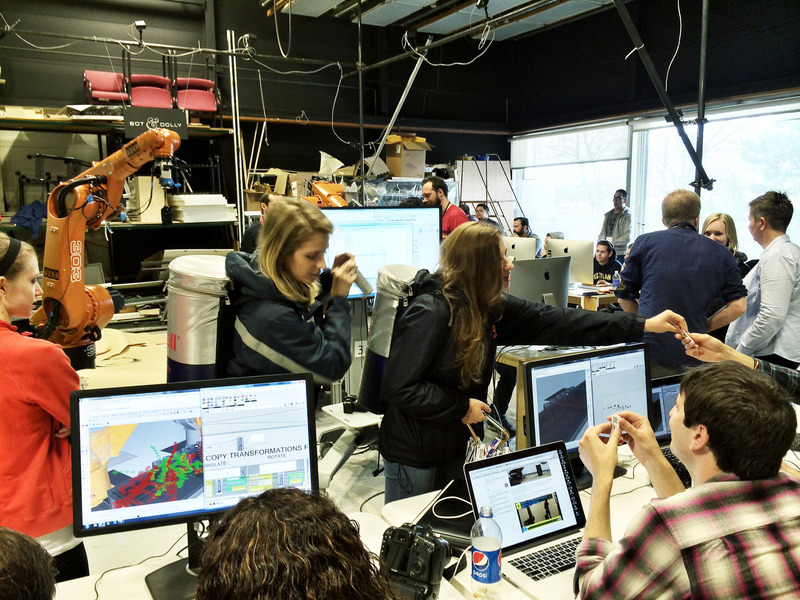 Harvard GSD also teamed up for another workshop with the Graz University of Technology and interfaced a Kinect sensor with an ABB robot. 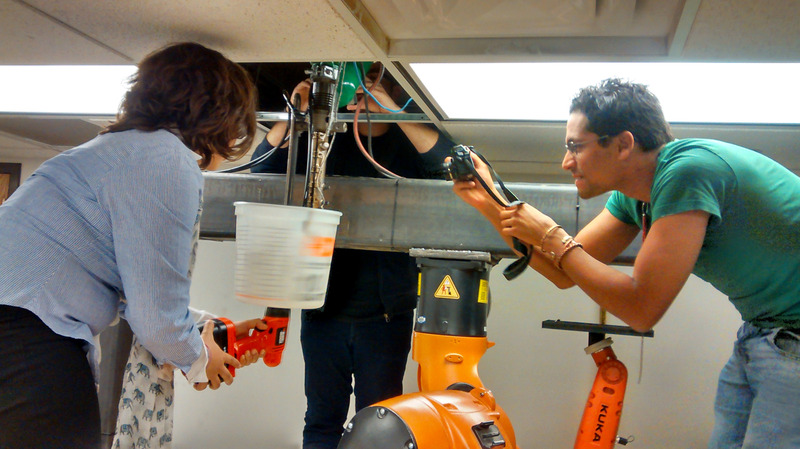 The eight workshop took place not too far at Princeton, where Princeton University and Greyshed worked with Augmented Materiality. The Rob|Arch community is now reaching a level of maturity where we can look back and see who really influenced the course of things, as well as whom we expect to significantly shape the future of robotic fabrication in architecture, art and design. To honour these individuals as well as company, the Association for Robots in Architecture established a series of awards that were handed out at the Rob|Arch 2014 conference dinner. 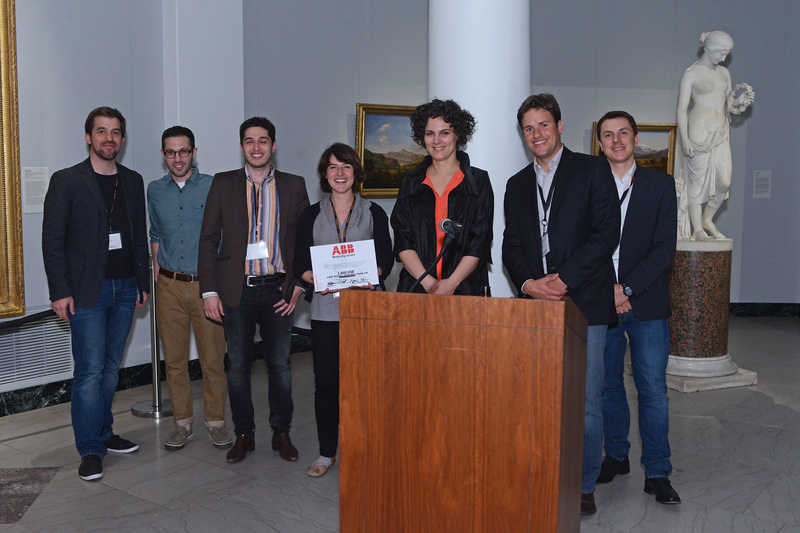 Through our sponsors KUKA and ABB, we were also able to award the best paper by a young researcher through the KUKA Young Potential Award, and to support students and individual researchers through the ABB Mobility Grant. 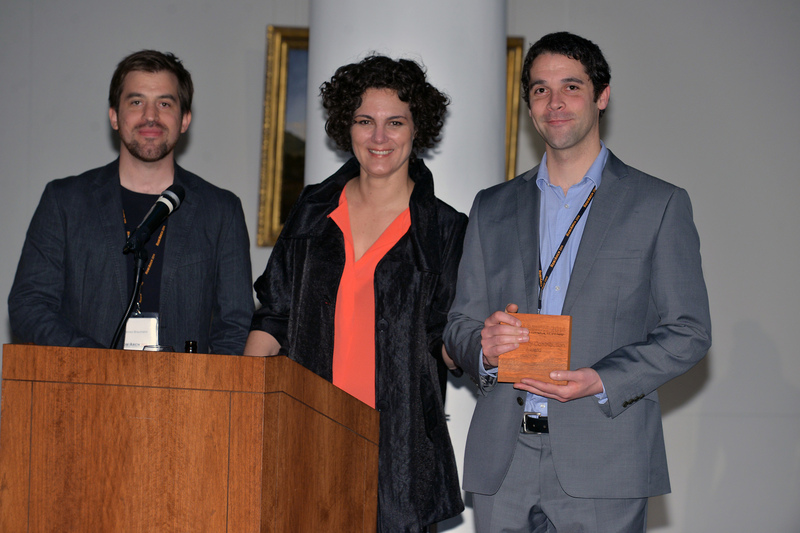 The KUKA Young Potential Award for the best scientific paper at Rob|Arch 2014 went to Ammar Kalo and Michael Jake Newsum of the University of Michigan and SciArc for their paper Robotic Incremental Sheet Forming. 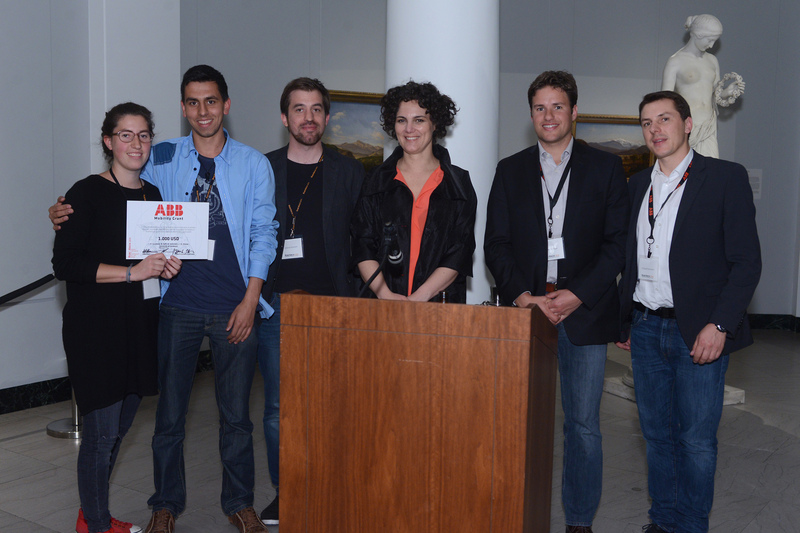 Altogether, three ABB Mobility Grants were awarded. 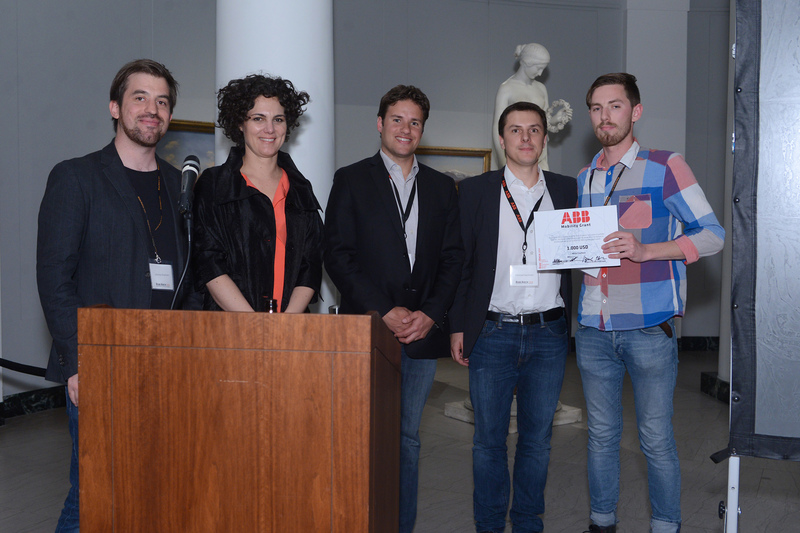 We congratulate Nikita Troufanov of SciArc, Alexander Walz, Pedja Gavrilovic, Maximilian Seiferlein, and Beatrice Huff of the University of Innsbruck, and Ahmed Hosny, Jared Friedman, and Amanda Lee of Harvard. As part of Rob|Arch, we sent out a Call for Videos to encourage submissions from artists and designers, as well as to give paper submissions the chance to illustrate their projects. More than 20 videos were accepted and shown at both the conference venue as well as at the evening event, where they were met with great interested. They will stay to be available online through the Association for Robots in Architecture’s Vimeo channel. Since Rob|Arch 2014 the videos have been accessed online more than 90.000 times! Of course, a conference is not only about showing ones work to the community, but about networking, setting up business deals, and finding new collaborators or employees. As such we were very happy that the range of attendees included CEOs of large robot manufacturers, representatives of several large industry players, and even organizations such as the Robotic Industries Association and the Association for Advancing Automation. We were especially thrilled about the number of startups, makers, and individual artists who either have already bought robots or are looking to invest in robotic technology. One of the best indications of the success of Rob|Arch may be that three of four demo robots that were set up at Taubman College were sold “on the spot”, in addition to many other sales that will be finalized in the coming months. Many job opening were also promoted, especially by ICD Stuttgart and ETH Zurich who both received significant funding to set up robotic research centers – a DFG grant for a Collaborative Research Centre at Stuttgart and a NFS for Digital Fabrication in Zurich. The Rob|Arch 2014 publication is available at Springer both as an eBook as well as in physical form. Members of the Association for Robots in Architecture can download it as a free eBook from the protected member section. 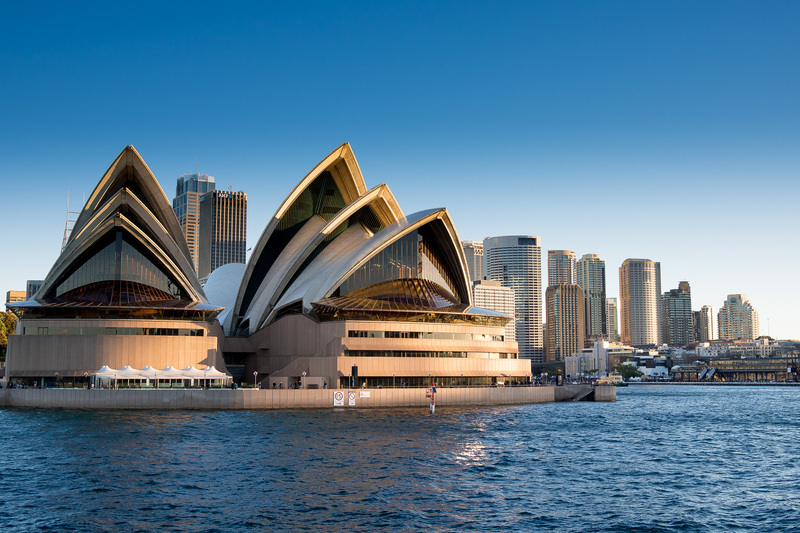 We are extremely thrilled to announce that Rob|Arch 2016 will be hosted at Sydney and chaired by Dagmar Reinhardt and Rob Saunders of the University of Sydney, in collaboration with all other Australian universities that will have robots by 2016, such as RMIT in Melbourne, Bond University in Gold Coast, Technical University of Sydney, Monash University, and the University of Tasmania. It’s already shaping up to be a very special event, so keep the end of 2016 (summer in Australia, winter in Europe and Northern America!) free. 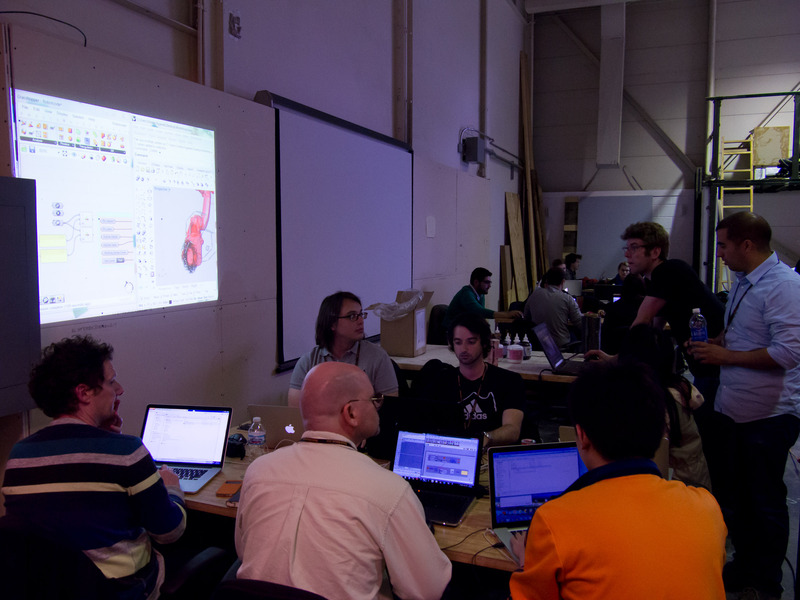 Today marks the second of three days of robot workshops at Rob|Arch 2014. This Rob|Arch, around 100 researchers, professionals, artists, and designers actively participate in the workshops, and twice as many are expected to attend the conference sessions on Saturday and Sunday. We’re absolutely thrilled by the quality of the workshops that offer their participants unprecedented insight into how both research institutions and also enterprises like Bot & Dolly interact and work with robotic arms. This workshop will demonstrate strategies for interactive and intuitive robot control during the design and fabrication processes. Rather than using the robot in isolation as a means for fabricating digital design, the robot acts as one of many mediators between the digital and physical world throughout the design process. Employing 3D scanning technologies in conjunction with user tracking, human interface devices, various sensors and augmented reality strategies, we are able to demonstrate multidirectional communication between the human designer, physical materials, computer simulation and robotic scanning/manipulation. Our scripts coordinate robot movements with projected images, thereby illustrating robotic toolpaths, user input information and structural calculations by overlaying them over physical geometry. The setup and tools will be used, experimented upon, and (ideally) modified by workshop participants. Permalink to Full conference schedule now online! Full conference schedule now online! The full conference program for the RobArch 2014 conference has been posted, please visit the schedule page for detailed information on paper presentations, keynotes, etc. Permalink to 2014 Keynote Speakers announced! The Conference Chairs and Advisory Board are excited to announce the keynote lecturers for the 2014 conference, showcasing the convergence of technology, industry, and academia which is at the heart of the Rob|Arch conference series. Go here for full biographical information! 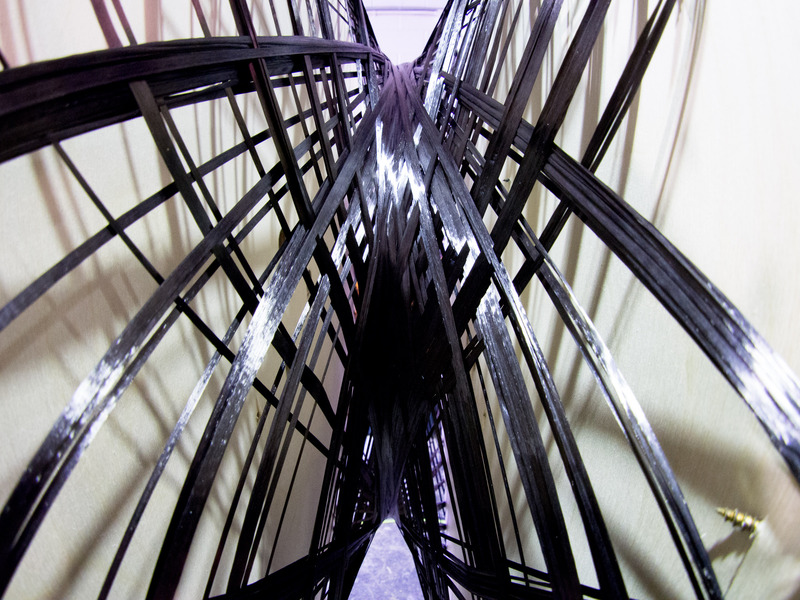 Rob|Arch 2014 and the Association for Robots in Architecture invite research institutions and companies, as well as individual artists, architects, designers, engineers, researchers, and students to submit video presentations of their “robotic” work to the Rob|Arch 2014 conference. The video clips should showcase new developments and innovative projects that are relevant to the conference topic of robotic fabrication in architecture, art, and design. A jury of experts will choose the best video submissions to be shown at the conference/exhibition to Rob|Arch 2014 attendees, among them CEOs of major robot companies as well as industry partners and internationally recognized researchers, architects, and artists. 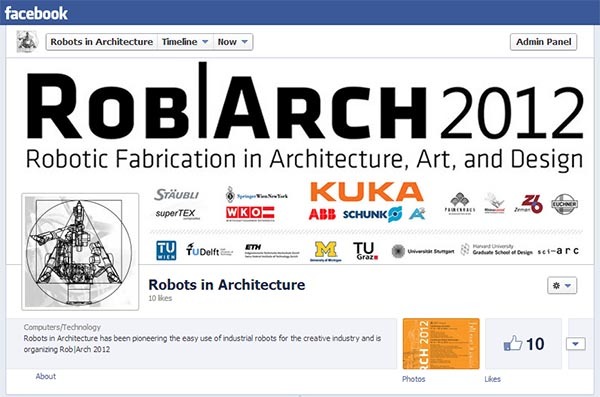 Furthermore, the video clips will be published on the Rob|Arch conference homepage, www.robarch2014.org, and via social media to a wide internet audience. Permalink to Early bird pricing has been EXTENDED! Early bird pricing has been EXTENDED! We have extended the deadline for early bird registrations until March 14th, 2014. We will post updated workshop availability soon, as several are almost sold out! The ABB Mobility Grant was initiated by ABB Robotics and the Association for Robots in Architecture to support individuals who are highly engaged in robotic applications in the creative industry. Three grants with a volume of 1000USD each support the grantee’s travel and accommodation costs for Rob|Arch 2014. It is the goal of the Mobility Grant to financially support individuals who do not have the financial support of academic or commercial institutions but want to engage in the robotic dialogue at Rob|Arch 2014. The grantees will be chosen by the board of the Association for Robots in Architecture and notified on 15.3.2014. Please note that the grant will be awarded at the conference, with the money transferred shortly thereafter. We’re looking forward to seeing you at Rob|Arch 2014! Permalink to Announcing the Kuka Young Potential award! 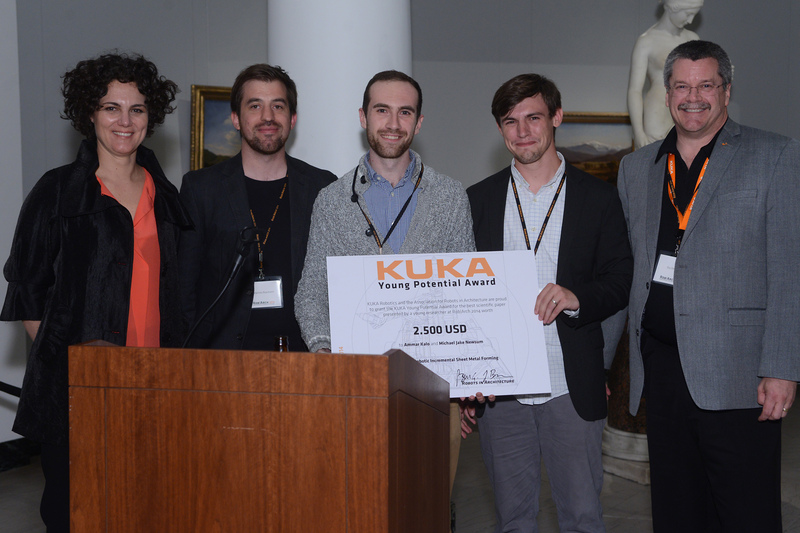 Announcing the Kuka Young Potential award! 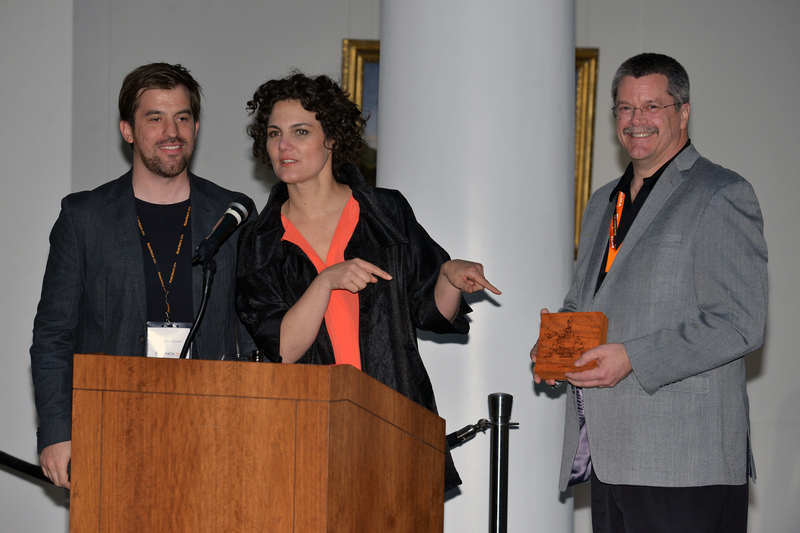 We are pleased to announce the continuation of the “Kuka Young Potential Award” for the 2014 RobArch Conference. 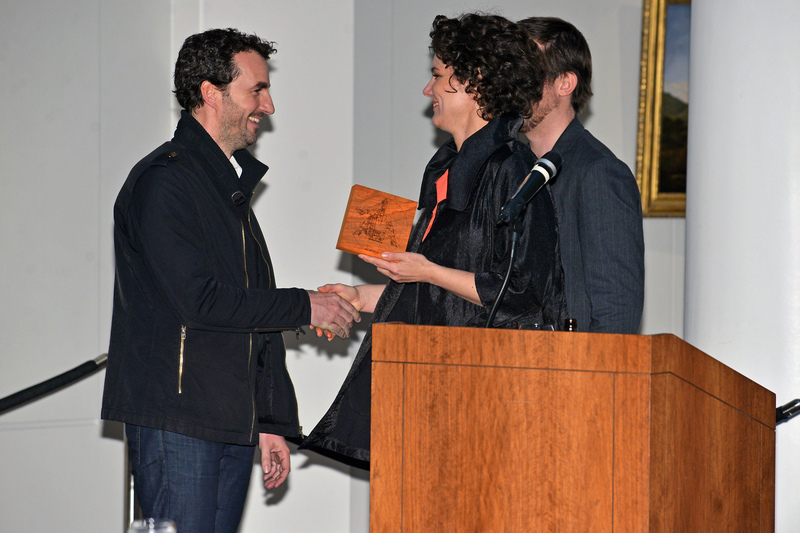 The Award is to support young researchers in the field of robots in architecture, art, and design. The KUKA Young Potential Award (worth 2500 USD) will be granted to the best scientific paper at Rob|Arch by a researcher of 35 years or less. Last Rob|Arch’s winner was Ryan Luke Johns of Greyshed for his paper Augmented Reality and the Fabrication of Gestural Form. Permalink to Final Call for Papers! Permalink to Registration for the 2014 Conference and Workshops is now open! Registration for the 2014 Conference and Workshops is now open! Go here for more information…. Permalink to First Call for Papers has been posted! First Call for Papers has been posted! The first call for papers of the 2014 conference has gone out. More information here…. In addition, Workshops for the 2014 conference have been selected by the Workshop Committee. We received 20 submissions, all of them very high quality. The first 7 workshops are now listed on the website. Permalink to Rob|Arch 2014 website is now live! Rob|Arch 2014 website is now live! In addition to the papers that were presented at Rob|Arch 2012 and published in the Rob|Arch book, the Association for Robots in Architecture sent out a call for video contributions to artists, researchers, students and companies world-wide. These impressive videos show the extremely wide range of robotic projects in the creative industry – from cutting-edge robotic milling, to new endeffectors, and even completely customized robots themselves. At Rob|Arch 2012, the video contributions were shown at the conference venue to an audience of 250 international experts. 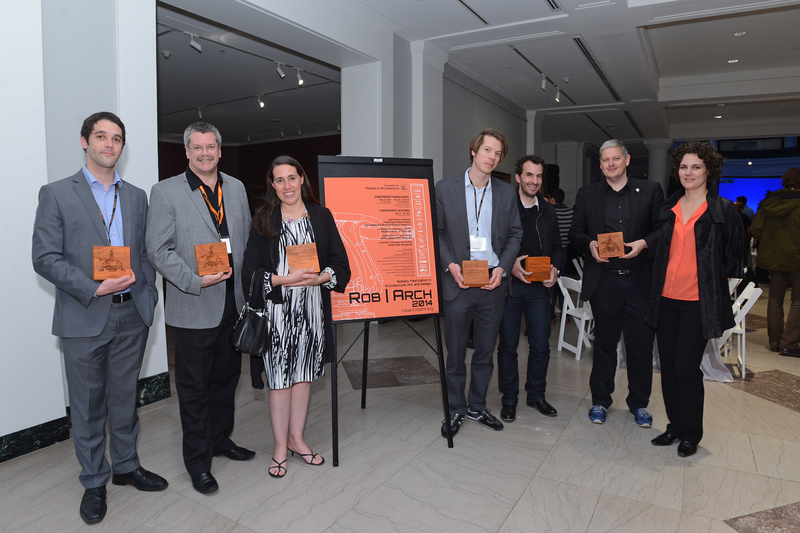 It is now our pleasure to present the Rob|Arch 2012 video contributions to a worldwide audience. Permalink to Rob|Arch 2012 Gallery posted! We hope that you had relaxing holidays and a good start into the New Year! Rob|Arch 2012 was a great success and we thank you for your positive feedback and the good wishes for the future events. From what we have heard, Rob|Arch not only provided great inspiration, but also lead to quite a few new collaborations and projects within the community. We have uploaded nearly 15mins of workshop videos at Vimeo and 360 photos both on Facebook and the conference homepage. 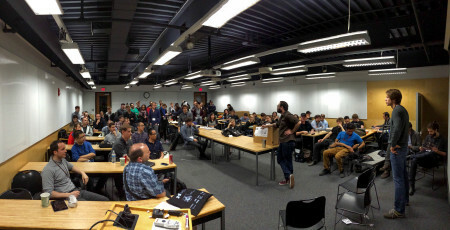 The video submissions and presentations will follow soon – we are still post-processing the huge data volume. We would like to thank nevv.org for their support, our photographers Eugen, Raimund and Marko for a good documentation, and all people involved in the conference workshops for their hard work. Finally, we want to introduce the new ROBARCH list, inspired by lists such as ECAADE and CAADRIA, which are of great use to the community. The new ROBARCH list will link together architects, artists, designers, and engineers involved in robotic fabrication and promote new events, posts interesting job openings etc. The first official ROBARCH eMail will go out soon, please let us know if you have anything to announce! Have fun with the first part of the online RobArch2012 documentation and thank you all for having been part of RobArch2012! With kind regards from Vienna! Go to www.facebook.com/robotsinarchitecture – you do not have to be a member of Facebook to view this page, as we will be posting publicly.